A good digital marketer should be planning, producing content, monitoring results and communicating with clients on the go, and thanks to smartphones and tablets, you are never too far from the information that you need to succeed. 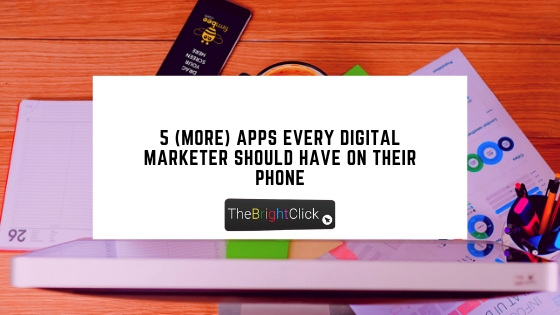 Here are 5 (more) apps that all digital marketers should have access to at all times. Have a look at our previous article for another 5 great apps to help make your digital marketing plan more successful! This freemium app allows you to stream live to Facebook Live but in a more structured, user-friendly way. Offering split-screens, frames, name tags and the ability to show comments on your Facebook live screen, this is a great way to add a bit more interest to any Facebook live broadcasts you plan to do. Ideal for creating graphics on the go, Adobe’s templates are what really makes this app unbeatable. Use pre-made templates and text, add your own product photo and you’re on your way in a matter of seconds. Perfect for blog headers, Facebook graphics or even Instagram quotes, this is a cracker little app that is worth its weight in gold; you can even add animated portions to really catch your audience’s eye! Anders Pink looks at the content that your target audience are engaging and interacting with most so you don’t have to. Ideal for finding the important topics and articles that are going to generate interest with your specific demographic so you can share them with them or create similar content that you know will get engagement time after time. If Instagram is a part of your digital marketing strategy, then Iconosquare is a real time saver. With this app you can schedule, plan and view insights for any Instagram posts you may want to share. From telling you when the best time to post is to allowing multiple profiles to be assigned to your account, this really is your one-stop-shop for Instagram marketing. A great way to quickly make new ads, tweak current ads, or just see how your ads are performing, the Google Ads app is a good way for you to keep an eye on how your ads are performing and to work out any changes that you could make.